Yes, Basementites, the era of the teaser teaser is alive and well. Sure, teasing a teaser seems like a pointless exercise, as the teaser is supposed to tease the trailer, which teases the movie. Anyway, a teaser for the much-anticipated Rogue One: A Star Wars Story teaser was released online this eve. It doesn't show a lot, as it's just a teaser. But after the great success that is The Force Awakens, people are pretty stoked to see what Disney and Lucasfilm have up their collective sleeves with this stand-alone story. All we know is Rogue One is about the band of Rebel fighters who stole the plans for the Empire's Death Star, which is a great way to launch these solo stories, in my opinion. 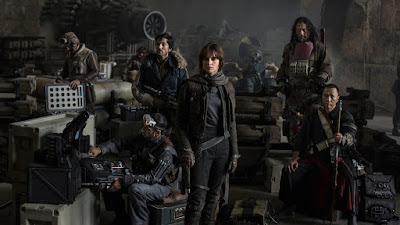 Oh, and Felicity Jones, Diego Luna, Donnie Yen, Mads Mikkelsen and Forest Whitaker star. The actual teaser for Rogue One drops during Good Morning America tomorrow morning. The movie hits theatres Dec. 16.